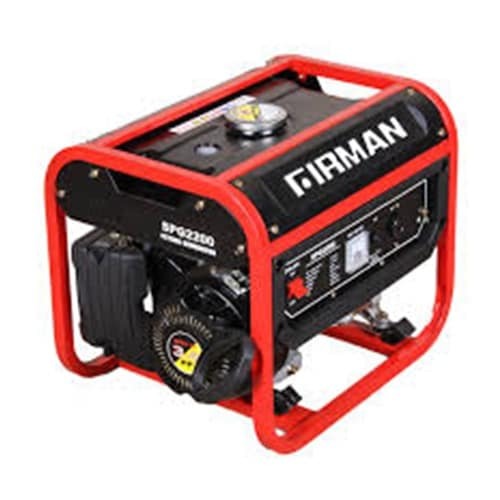 Sumec firman generator spg 2200 1.8kva max./1.5kva rated, is newest model of firman generator family.this generator is sure to work for house or flat of up to 6 rooms it can carry your television no matter the size a/c output 220v-1.8kva max./1.5kva phase. - single phase alternator. -built with 100% copper wire, brushless, self- exciting synchronous 2pole. Tank capacity - 5.5 liters run time per tankful- 9 hours @ 50% load fuel. - petrol noise level at 7meters- 63db weight- 24.5 kg measure; l* w*h - 445*357*360 starting system, recoil only (with rope) : note; please use original oil for the generator to last a long time and always remember to check oil level and change the oil when necessary. Please note: do not use mobil oil for this generator as it has been discovered to be to light. Use either super v oil or conoil golden super oil. You can also use tech oil . Only sealed oil should be used for longer engine life and best performance. Our best promotions sent to your inbox.